Patients with midgut neuroendocrine tumors (MNETs) frequently present with metastatic disease at the time of diagnosis. Although combined resection of the primary MNET and liver metastases (NELM) is usually recommended for appropriate surgical candidates, primary tumor resection (PTR) in the setting of extensive, inoperable metastatic disease remains controversial. A systematic review was performed according to PRISMA guidelines utilizing Medline (PubMed), Embase, and Cochrane library—Cochrane Central Register of Controlled Trials (CENTRAL) databases until September 30, 2018. Among patients with MNET and NELM, 1226 (68.4%; range, 35.5–85.1% per study) underwent PTR, whereas 567 (31.6%; range, 14.9–64.5%) patients did not. Median follow-up ranged from 55 to 90 months. 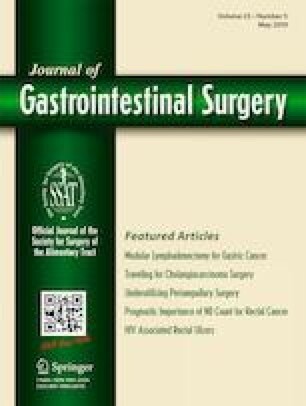 Cytoreductive liver surgery was performed in approximately 15.7% (range, 0–34.8%) of patients. Pooled 5-year overall survival (OS) among the resected group was approximately 73.1% (range, 57–81%) versus 36.6% (range, 21–46%) for the non-resection group. For patients without liver debulking surgery, PTR remained associated with a decreased risk of death at 5 years compared with patients who did not have the primary tumor resected (HR 0.36, 95% CI 0.16 to 0.79, p = 0.01; I2 58%, p = 0.12). For patients undergoing PTR, 30-day postoperative mortality ranged from 1.43 to 2%. PTR was safe with a low peri-operative risk of mortality and was associated with an improved OS for patients with MNET and unresectable NELM. Given the poor quality of evidence, however, strong evidenced-based recommendations cannot be made based on these retrospective single center–derived data. Future well-design randomized controlled trials will be critical in elucidating the optimal treatment strategies for patients with MNET and advanced metastatic disease. The online version of this article ( https://doi.org/10.1007/s11605-018-04094-9) contains supplementary material, which is available to authorized users.